Of what is past, or passing, or to come." Saint Mark's Basilica (Italian: Basilica di San Marco a Venezia), the cathedral church of Venice, is the most famous of the city's churches and one of the best known examples of Byzantine architecture. It lies on St Mark's Square (in the San Marco sestiere or district) adjacent and connected to the Doge's Palace. Originally it was the "chapel" of the Venetian rulers, and not the city's cathedral. Since 1807 it has been the seat of the Patriarch of Venice, archbishop of the Roman Catholic Archdiocese of Venice. 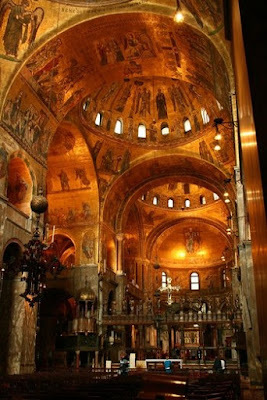 For its opulent design, gilded Byzantine mosaics, and its status as a symbol of Venetian wealth and power, from the 11th century on the building was known by the nickname Chiesa d'Oro (Church of gold). 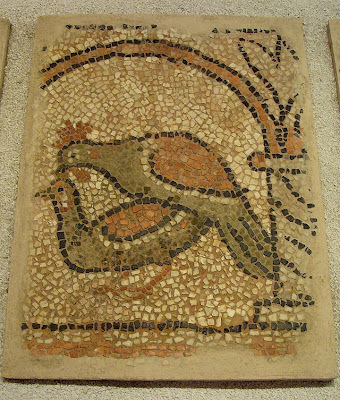 Mosaics were more central to Byzantine culture than to that of Western Europe. Byzantine church interiors were generally covered with golden mosaics. 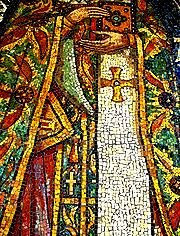 Mosaic art flourished in the Byzantine Empire from the 6th to the 15th century. The majority of Byzantine mosaics were destroyed without trace during wars and conquests, but the surviving remains still form a fine collection. 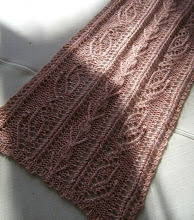 When searching for a name for this stole design, I was forcibly struck by the memory of St. Mark's basilica in Venice. The church glows with the reflection of light struck golden from the glorious mosaics which cover every surface. It is stunning. We forget that these mosaics are much diminished by age and wear. The originals were vibrant jewel boxes of color. I LOVE this design. So easy to do and such beautiful colors. 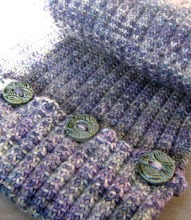 You would think it was the result of painstaking multi-stranded, two-handed, hard-to-juggle fair isle. 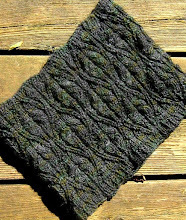 This is mosaic knitting, where you knit two rows in each "color", slipping the other stitches from the row below to form the design. 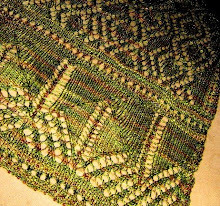 This is a six-stitch, sixteen-row repeat. 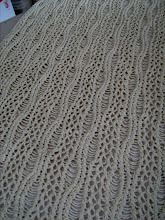 And since your wrong side rows are repeats of the previous row, the pattern is easily memorized. 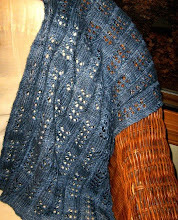 Done on size nine needles, it practically pours off the needles. And it is so much fun to watch the colors develop. 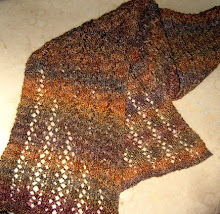 I used only one color of the Silk Garden Lite. I simply started the two strands at a different point in the color run. I also adjusted the colors as I went. 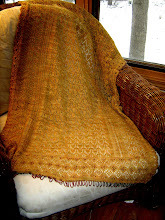 If I didn't like the way it was shaping up, it was easy to break one of the strands, take some of the yarn out, rejoin and continue on. 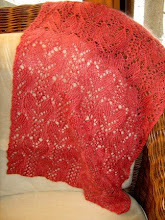 I can't wait to wear it - maybe to see Julie and Julia at the movies this weekend? Air-conditioning be damned! You will definitely be seeing more mosaics coming your way in the future - just too much fun. I LOVE, LOVE, LOVE the new pattern!!! Lovely, can you post a picture of the back? Oh my goodness, you are killing me. Just when I start wondering if I dare contemplate adding your last piece to my list because it is lovely, you bewitch us with something this fabulous. 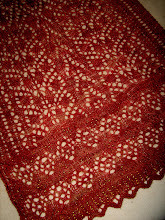 Must go get SOMETHING off the needles so I can justify adding this charmer. 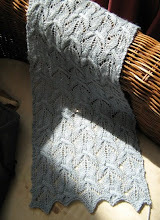 Can't wait to start on the Byzantine Stole. 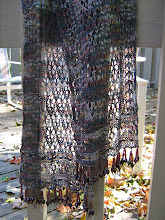 Silk Garden Lite is one of my favorite yarns to work with, and you r pattern is scrumptious! 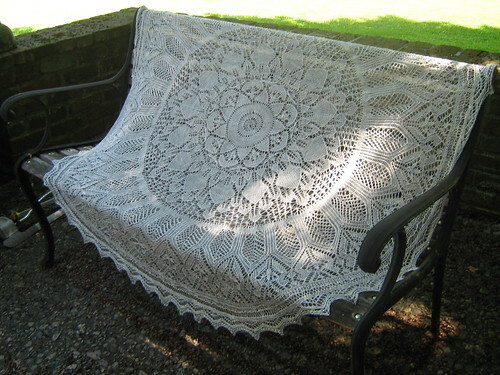 I will make it into a throw to cuddle under while watching tv and knitting. Thank you for creating and sharing this pattern. 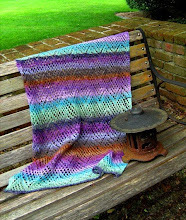 I was wondering if you could adapt this to use Noro Silk Garden Sock yarn. I have that and I'm not in a position to buy new yarn for awhile. Thank you. Just bought your pattern.